Beaches of Dubrovnik you must definitely visit! – Exploring Life..
Dubrovnik’s beaches depict the Mediterranean as it once was. The city is lined with crystal clear rocky, pebble beaches. The warm temperatures and the clear waters makes these beaches an ideal place to swim during your vacation. The most popular of the Dubrovnik public beaches are Banje , Lapad bay beaches and Buza beach. The water temperature is 25 degree celcius which is very comfortable to swim in 🙂 . We got a chance to visit the Banje beach, the Little Pile beach facing lovrijenac fortress and the Buza beach. It is a small beach near the pile bus stop a few stairs down.It is a great place for a refreshing swim after walking in the old town. It has showers and changing rooms. There are some cute restaurants on the rocks adjacent to the beach to have drinks. The beach is flanked by the lovrijenac fortress and the Bokar fortress. It is not very crowded, so if you want to move away from the noisy Banje beach this is a good close alternative. The hotel on the side atop the rocks has a good view of the waters and a nice place to chill. Water: The Water is murky. Not clear. Sea Bed: Rocky. It is not flat and the rocks are covered with mosses. I was scared to step down as I felt velvety stuff on my legs. If you have snorkeling kit with flippers it is accessible. Snorkeling: Not a good beach to Snorkel. The water is murky. A part of the beach is private and a part public. The Banje management charges for using the showers and toilet too (5 Kunas) . The romantic white tents to sit by the beach are also charged. Over here it is better to bring your own towels and sheet to sit on. It is very touristy here so during peak times its hard to find a place to sit on the beach. Snorkeling: It is a wonderful beach to Snorkel. Dont expect coral reefs and colorful fishes inside. The water is clear so its good to snorkel and a decent marine life can be seen. 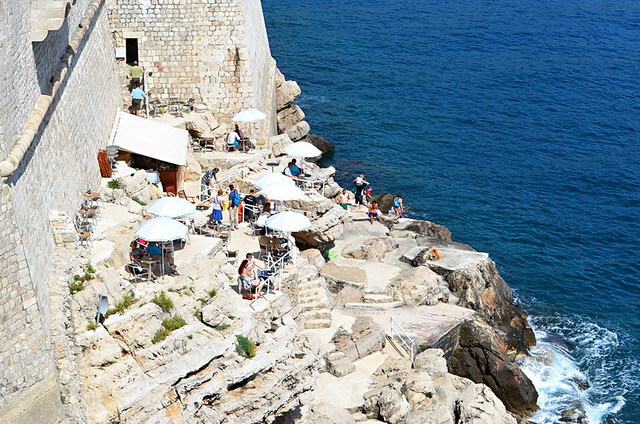 Buza bar is one of the most beautiful bars in Dubrovnik . It is hanged on the cliffs right above the sea, with an amazing view of the Adriatic. It is also known as the “hole-in-the-wall” . It is kind of hidden from the touristy locations. When you gaze around the city you will find a board ‘ Cold drinks inside with the best view’. We followed it and ended up here. They serve only drinks. It has a panaromic view of the sea which makes it an ideal place to unwind. It is perched on a cliff and people can regularly be seen swimming in the beautiful blue Mediterranean Sea below. We heard good reviews of Lapad beach but sadly it was out of town and we did not have time to visit it. Visited other beaches in Dubrovnik? . Please post it in Comments!